When it’s an extraordinary diamond ring you’re after, look no further than Juno Jewelry’s wide selection of unique diamond rings to provide you with all you need to solidify your love for eternity. With an incredible variety to choose from, you will undoubtedly find the absolute perfect ring for your beloved bride-to-be. Aside from affordable pricing and a stunningly beautiful collection, Juno Jewelry is dedicated to helping you locate the unique diamond rings of her dreams. We love being a part of this momentous occasion in your life, and with our help, it is sure to be a memorable one to be cherished forever. There are numerous ways to ensure your love’s wedding or engagement ring is totally unique. Don’t be afraid to think outside the box. Whether it’s an untraditional color, cut, stone or band, our selection of unique diamond rings is sure to provide the extra dose of pizazz many brides crave when dreaming of their big day. Your bride-to-be is one of a kind, and so should be her wedding ring. Call Juno Jewelry to hear about what you can do to ensure her ring is unlike any other she’s ever seen. Juno Jewelry’s incredible collection of unique diamond rings boasts a number of gorgeous styles sure to elicit an automatic sense of joy in your loved one. Choose a lovely channel set princess diamond ring, a bezel set eternity ring, or one of our three-tone rings that combine outstanding white gold, yellow gold and rose gold to form a ring of perfection. Not only are these ideal for brides with an appreciation for all stunning metals, but with its unique appearance, it’s sure to pair beautifully with anything and everything in her closet. While clear diamonds are the traditional route when it comes to wedding and engagement rings, you can choose a pink, yellow or blue sapphire stone to cater to your beloved’s unique personality. It’s these special touches that make the world of difference in how your gift is received. As a romantic gesture, personalize your loved one’s ring with a beautiful scripture or quote to prove just how deep your love runs. Speak to one of our customer service representatives for more information on how to make this lovely sign of your love come to fruition. Whether it’s Shakespeare, Lord Byron, Led Zeppelin or even Beyoncé, select a quote that is sincerely meaningful, and the message is guaranteed to last forever. Juno Jewelers is committed to providing a superior customer service experience for our valued customers. In addition to a gorgeous, wide selection of engagement and wedding rings to choose from, we offer affordable pricing, a quality guarantee and a warm and friendly staff to accommodate any questions or concerns you may have regarding our fabulous stock of unique diamond rings. 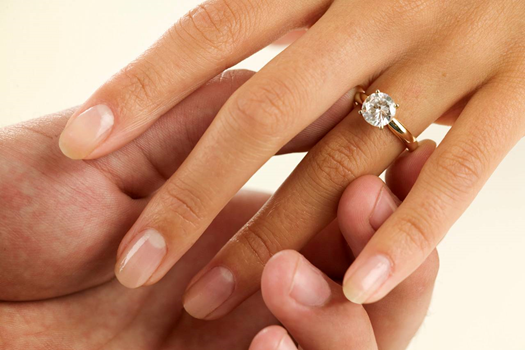 Call or order from Juno Jewelry online today to begin the process of selecting the engagement or wedding ring of your dreams.